Claude is a greyhound, an ex-racer who has been off the track less than a year. He is wonderful and perfect in almost every way. He is not 100% clear on when and where it is appropriate to mark things (or people, apparently) — today was the first time he peed on a person! He must have mistaken the gentleman for a tree or a shrub. Awkward. Editor’s Note: My papa’s name is Claude, so this makes it just that much better! Oh Claude, so naughty but so beautiful! Perhaps he needs an eye exam!?! Poor Claude. I’m sure you’ll get the hang of things soon. Congratulations on your ‘retirement’ from the track and your loving new home! OMG this is so hilarious…. Best one yet! 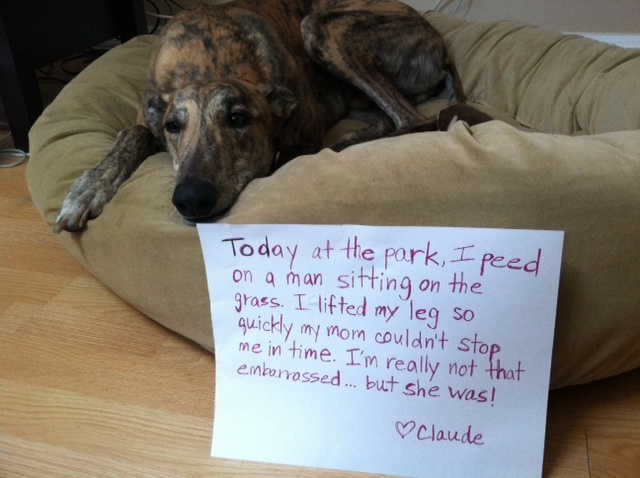 Claude you are so cute, you do look a tad embarassed. My First Dog did just that as I was in the middle of a conversation with a neighbor! I had to cut our conversation to the quick and finished walking First Dog. 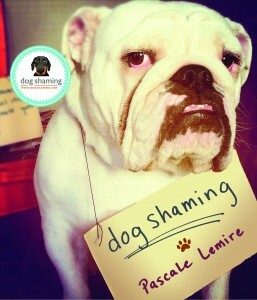 Shame? He had none to spare. I learned never to interrupt HIS walk again. We all slip now and then….I hope the person who got peed on has a sense of humor………..doggie just learning the ropes…………thanks for rescuing him. Claude is my grand-pup. He is a real charmer and hardly makes any mistakes anymore. I have taught him how to sleep on the futon AND the bed! He is soooo smart that way. . . .